Buying a vehicle is definitely a luxury. They are quite expensive, whether they are brand new or secondhand. However, if a client has already made up his/her mind about buying a vehicle, there are multiple ways on how you assist them when it comes to payment. You can give them options such as through layaway plans, through the help of a finance company, bank loans, or credit plans. Whatever platform they may choose, you will be responsible for issuing them a payment receipt to keep a record of the transaction. Here we give you six Sample Receipts that you can use to make your own vehicle payment receipt. Check out all of the samples we have and choose one that you like best. A vehicle payment receipt will look a lot like a vehicle bill of sale since you need to log all the important details in the receipt. The following format may not be the actual sequence that the receipt may undertake. However, this is the common fields that are usually found in the Sales Receipt Samples in this article. With or without defects, replacements, repairs, or whatsoever, it should be disclosed in the vehicle payment receipt. It should state whether the vehicle is in good working condition or otherwise. This section will also state if the seller will allow the buyer to have a mechanic inspect the vehicle, and if upon inspection it is deemed to have unsatisfactory results, the buyer has the right to cancel the transaction. not the actual mileage as there are discrepancies in the odometer. This is the section where the mode of payment is stated as well as the financial assistance that was used, if applicable. 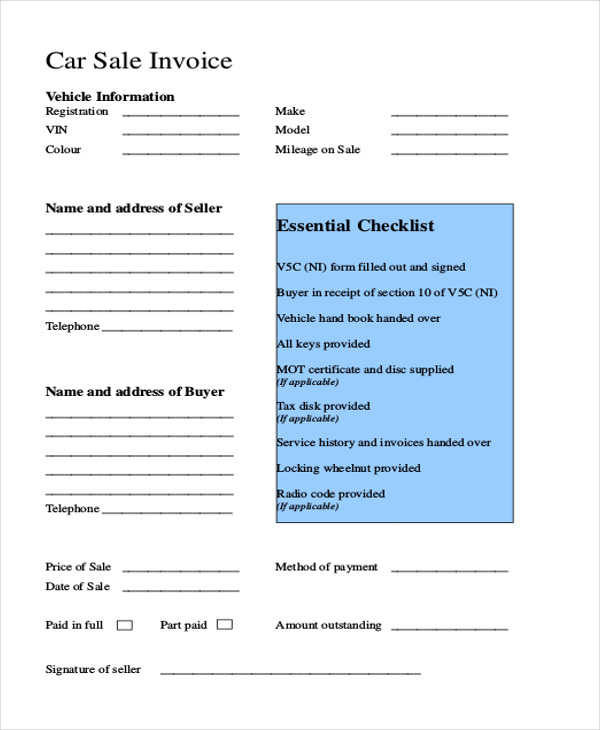 The vehicle Payment Receipt Samples we have in this article for you have already been designed to have the correct and proper format that you can follow when drafting your very own vehicle payment receipt. 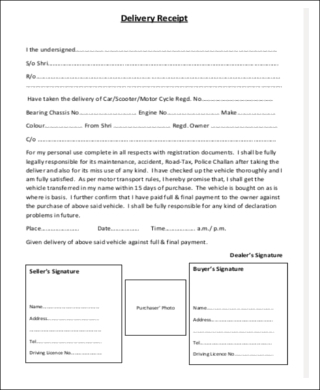 You can simply follow the design/outline that is reflected in the sample and use it for your own vehicle payment receipt. There are two file formats available for the samples: (1) PDF and (2) Word Document. You have a choice which file format would be most convenient for you and which one you think will work best for your payment receipt needs. You may also opt to download all of the samples we have since they are all offered free of charge, and incorporate the ideas that you will get from each sample. 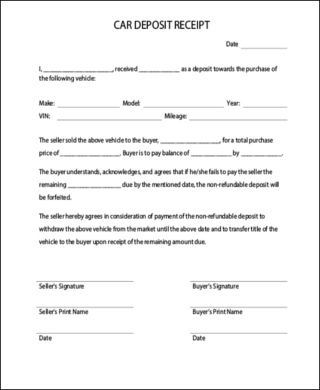 The vehicle payment receipts will serve as a good proof that there was a transaction between the seller and the buyer. This form will reflect the amount of money that has been paid and the remaining amount that needs to be paid, if applicable. This will help lessen any misunderstandings that may arise that is related to the sale as it will be easy to trace the transaction.